impressed me was the length of the train. It appeared to be at least a mile long, possibly some multiple of that. Sleepy's video mentions that the advantage of the Hyperloop system is that it lowers air resistance. Doesn't each car in a HSR train, with the exception of the lead car, share the air resistance of that lead car? Wouldn't a 3 car train have ~ the same air resistance as a single car or a 10 car train? In the last one you will also find the history for this. It started when Elon was three years old... Without flame throwers and boring company. The only advantage of putting a train in a (vacuum) tube is reduced air friction, and thus reduced cost. However, building a vacuum tube is crazy expensive. - Thermal expansion (day/night) of the tube is something like 150 meter over a 600 km track. Even if you somehow manage to let the whole tube 'role' linearly, that expansion would cause the entire start and end stations to move back and forth 150 meters every day and night. How is that going to work ? - Airlocks would be needed at start and stop stations. Airlocks that can draw a vacuum in minutes. Has that been tested yet ? - How do you turn the pods around at start and stop stations ? - How do you 'split' a MagLev track, so trains can go to more than one end station ? - How do you prevent catastrophic failure of the entire system (killing everyone in any pod in the tube) in the case one pod comes of its tracks and penetrates the tube ? - What to do if a pod gets stranded off the track in a 600 km long tube, with no way out for the passengers ? It's so much easier to build a HSR system, and that is hard enough. I don't think we are going to see a Hyperloop any time soon. I concur Rob, the devil is in the details and this idea is 44 years old, and counting. Interestingly the Swiss also concluded (like that NASA study) in their final study from 1999 that the the tube will need to be larger. Adding pic 13. The difference is that they never read Elons paper from the future. impermeable layer between two concrete rings. conditions of the rock and/or an increase in the operating frequency, could lead to thermal problems and construction of a tunnel cooling system was required. They concluded that the vacuum level and the tunnel diameter is a compromise between investment costs and operating costs, to fulfill criterias related to safety, thermal issues etc. But still, no real world tests and Swissmetro went into liquidation in 2009 due to lack of support. No wonder. Then came Elon in 2013 and hyped almost everything. Without Hype'loop it's like the Jetsons without the jet. speeding along care-free at 124 mph / 200 kph would be like heaven on earth — or, heaven under earth! and subway tunnels are not that exiting or even new. I did not mention the hyperloop here, you did. “124 mph / 200 kph“ is the speed of the skate/sled concept, which my previous comments described. Travelling in your own car, or in a mini-pod, directly through a Boring Company tunnel to your destination, is a far cry from any subway train. Thermal expansion is probably of greater concern in the desert than anywhere else. Yet Dubai is planning a hyperloop. I did not mention the hyperloop here, you did. Not in a mood to argue semantics. Let’s just drop this. Fine, but semantics? Definitely not. Dubai is all set to have a 20km prototype of hyperloop by 2020. At 20km, thermal expansion is manageable. At 600km, there is a real problem. I kind of like that animation of a skate/sled concept. But it would leave huge holes in the surface when the 'sled' is in use. Would it not be more practical to simply drive the cars through that tunnel ? To prevent air toxification, you could restrict it to EVs, which would be a great incentive to drive EVs instead of ICE vehicles. Also surely a Tesla Model S can reach 200 km/hr, so with a bit of electronic guidance the 'sleds' would be obsolete. I haven't pondered too much over that pimped subway, but it sure is a weird way to solve public transportation by moving 17.5 times more weight than needed. And there are numerous differences between the loop and the hyperloop, at least 450+. Please explain. Are you assuming there are no expansion joints along the path? How much expansion can one of these expansion joints absorb under a vacuum ? Agree oren, but it was Sig who brought the loop here, which also was the reason for my earlier discussion with him above. And there seems to be some confusion of which is what in some other comments. You would need a lot of expansion joints, and therefore also get thousands of potential points of failure. This has been mentioned many times before by a lot of engineers. Also upthread. Remember, we are not talking about the loop = 150 mph on rails here. We are talking about hypersonic promises at 0.001 atm / 0.015 psi / 750 microns. Compare to the Swissmetro study above, 310 mph at 0.01 atm / 0.15 psi / 7600 microns. And that with thousands and thousands of welded steel or rubber joints. 750 microns, 100Pa or 0.015 psi equals 99.9% vacuum. Adding an image with the expanded air ratio for temperatures at 60° F or 15.5° C.
Those are pretty good reasons to assume that speeds higher than that, are not feasible. You would need a lot of expansion joints, and therefore also get thousands of potential points of failure. Going back to the "20 km no problem" from coast to coast it's about 4,500 km from LA to NYC. So, 225 expansion joints on a coast to coast run. And we might see a hub and spoke system with a two hour run east from LA and then passengers would switch to a route headed to various locations. The number of potential leak points along a single stretch might be closer to 100. Then there's leakage and failure. With a refrigeration system losing the coolant results in system failure. With a small leakage into the tube it might mean using more energy to keep the partial vacuum in place while the leak repaired. Or perhaps there would be constant leakage that would have to be factored into the energy budget. Apparently work will start on the first long distance tube next year (IIRC). It shouldn't be too long before we see a real world test. That would mean that every expansion joint would have to be able to move 10 metres, if you calculate on a maximum temperature difference of just 40K and only 0,5mm/m for steel pipes, and also zero thermal effects from the pod at supersonic speeds inside. That Swiss study above recommended a cooling system dispite beeing built into rock and concrete. With a small leakage into the tube it might mean using more energy to keep the partial vacuum in place while the leak repaired. Or perhaps there would be constant leakage that would have to be factored into the energy budget. 99,9% vacuum is indeed a partial vacuum, technically speaking. But also like 50km up, in the stratopause. There was a section regarding energy consumption and cost vs tube pressure in the first link in my post above to that NASA study. How would heat be generated by the pod if it's traveling through a near vacuum and emits no heat other than what might leak out from the compartment? There would be no road friction heat. - Could move the next skate/sked into place as the current one departs. (Details of entrance functions haven’t been shown yet. ) Horizontal elevator doors? -“Elevator” entry means entrances take up no more room than a big parking space, meaning no big ‘station’ or tunnel entrance needs to be built, so lots of entrances can fit within existing city blocks. - ICE cars will outnumber EVs for some years yet; turning them off and whisking them away reduces pollution as well as traffic. - A fleet of computer-controlled skates/sleds all with the same specifications are more likely to be able to maintain the close, one-car-a-second flow needed for speed and efficiency. The speed and exacting performance needed is beyond the ability of most cars — what if they enter without enough charge to complete the trip? Few cars will have anything like the computer control required for such travel, for years yet. - Sleds/skates allow easy inclusion of “people pods” and cargo pods with equivalent performance, and programming, into the system. There's still air friction, whatever waste heat the propulsion produces (that depends on the propulsion system), and heat radiating out of the pod (I assume it'll be at room temperature, whereas the tunnel would start out rather cooler). So am I Bob, that's why I'm still here. The idea is still fascinating and has fascinated people for more than a hundred years. Aircrafts never cruise near transonic speeds for a very good reason. Either they go Mach 0.8 or they will have to go a lot faster than Mach1. Had some time over and sat down to find out. I found very few numbers, maybe placing an order will provide better results? If that were to be true for the real hyperloop joints, a 600km tube would require more than 7500 of these joints! That's using a 40K maximum temp difference and 0,5mm/m which is slightly lower than for steel pipes. And you will have to replace all of them after a while. Adding an image from that project pdf with the larger ones in DrTskolus link above. That was a staggering 16 joints which according to them, never has been done on site by another manufacturer. It wouldn’t be one uninterrupted tube. There will be stations along the way — a good place for slip joints. The paper conceived of a hyperloop system ... at an average speed of around 600 mph (970 km/h), with a top speed of 760 mph (1,200 km/h). Passenger jets travel 878 – 926 km/h; 546 – 575 mph. The speed of sound is 1,192 km/h; 741 mph. Elon envisioned the pod traveling at about the speed of passenger jets, not the speed of sound. Is it reasonable to assume a 40k range for thermal expansion purposes in a concrete-lined tunnel underground? I know nothing on the subject but it sounds a lot, especially when the assumption is for the whole length of the tunnel, rather than some local heat source like the pods etc. Probably in a desert climate the effect will be magnified, but in a California climate? Any data anyone? There's a risk of mixing up a 'loop built in steel tubes above ground and and a 'loop built many feet below ground in tunnels. Just pointing that out so that people can be alerted to be clear in their comments. Thank you Sleepy. That is good data to start understanding the problems with thermal expansion on Hyperloop design. And to address the comments from oren and Bob, I think it is fair to assume that thermal expansion is much less of a problem for tubes that run underground. But then, a tube that runs underground will be even more expensive (and has more issues) than tubes running above ground, which is more expensive (and has more issues) than simply running a MagLev without a tube, which is more expensive (and has more issues) than simply running HSR. We'll see where this goes, but based on that reasoning, I don't have much confidence that Hyperloop will ever make it beyond prototype stage. I don't think that really works. For starters, sealing vacuum chamber slip joints don't exist yet. So the only 'slip joints' that you could put in are at the start and end stations of the longest non-stop route, regardless of any split-offs to intermediate stations. At 600 km the thermal expansion is something like 150 - 300 meters, depending on the temperature range you need to handle. That means you would need a design that allows for entire stations to move back and forth 150 - 300 meters. And that assuming that the tube itself moves almost frictionless over its support system for the entire 600 km route. Yes, we need more data. A lot more. Reiterating Elon's self-contradictory idea paper from 2013 won't help much. Concrete has a temperature expansion coefficient that is similar to steel. I used 40K above, building the hyperloop above ground would require a lot more. Tin roofs here are specified for thermal expansions from -35°C up to +75°C, according to Swedish professionals. Adding an easy graph to eyeball. Another issue with Hyperloop is the pod design. If this pod is supposed to operate at near vacuum conditions, there is no way that you can mount one of these Tesla pop-up doors in it. You need to have a spacecraft-style sealing lock instead. Which makes me wonder how much Elon thought his idea through. Probably not enough. A genius provides new ideas, like Tesla. Most of us normal humans are very good at improving other peoples inventions. Like Otto's engine from 1876. Which is as old as our tunneling dreams. Sleepy, I believe genius to be the exact opposite of what you describe. Ideas are a dime a dozen. Succesful execution of ideas is the hard part. People that can successfully execute ideas in extraordinary ways are genius. Under this definition Musk is a genius not for his crazy ideas, but for the succesful execution of them. Bob Wallace I love the discussion so far and find the counterpoints compelling but you are right about the distinction between underground tunnels and surface tubes. The distinctions between the two get muddled in the discussion. Swedens most famous entrepreneur died recently, Ingvar Kamprad. Care to calculate his footprint? Ha. Nice article, but I was thinking more along the lines of his accomplishments like accelerating the advent of electric cars, reusing rockets profitably and arguably creating the first succesful internet bank. I have always believed that Elon's priority is to colonize Mars. Space X will get him there, the Boring company will build the habitat and Tesla will help save the world from self destructing before he can get to Mars. So the GoT messianic references are right on point. Which makes me wonder how much Elon thought his idea (Hyperloop) through. Obviously not all the way through. Elon presented what he thought was an interesting idea but stated that he did not have time to fully develop it. He gave the idea to whomever wanted to take it and run. Elon may have made a bad assumption that there would be a way to allow for steel tube expansion while maintaining a near vacuum. It's left up to others to find a solution, if there is a solution. Elon assumed 'sports car' seating in low diameter pods. Perhaps much of the market wouldn't accept that. We see current designs using pods more the size of regional passenger jets with narrow aisles and toilets. Perhaps the larger diameter would make the costs too high. Perhaps there will be a return to small diameter pods. It's impossible to see all the answers when you're standing at the starting line. I'm looking forward to see if other smart people who have taken on this project will be able to find the needed answers. If you have 10 stations along the 600 km path, and two slip joints per station, 20 joints would only need to deal with 7.5 - 15 meters each. The stations wouldn’t move. They missed “Zombie Defender,” Musk’s self-ascribed Twitter profile during the recent toy flame-thrower funding days. The man works insanely hard. But he also knows how to have fun, and isn’t afraid to share it. 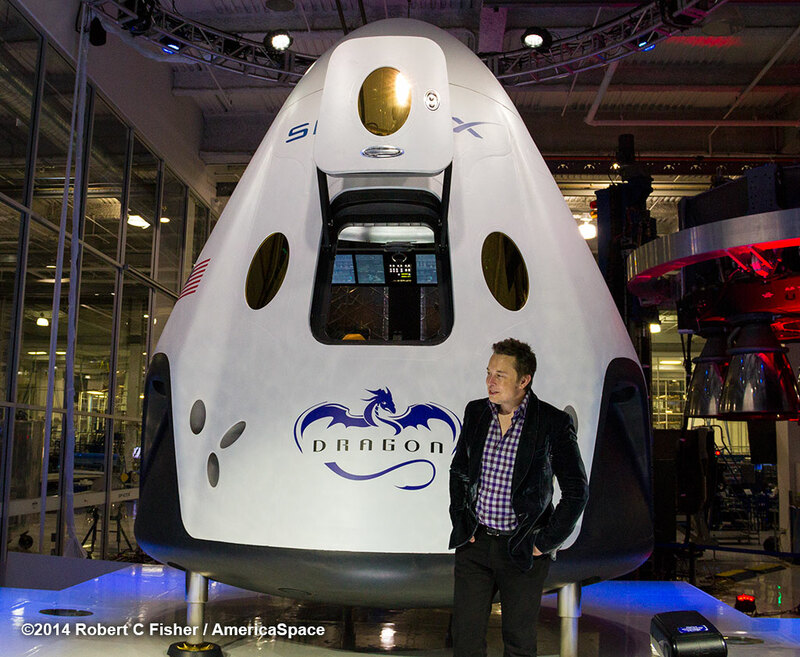 Musk’s SpaceX Dragon capsule has a passenger and cargo door that maintains a breathable atmosphere inside while withstanding direct contact with launch forces to space, the hard vacuum in space while attached to the International Space Station for weeks or months, and then survives a flaming reentry and splash down in the ocean. It’s a good bet he knows what’s required for a hyperloop door. Jokes aside, a practical Hyperloop pod would need an improved (due to larger pressure differential) airplane plug door, and it cannot be anything larger than that. And certainly not the Tesla style flip-up doors that Elon showed in his whitepaper. But here we go : If the door cannot be larger than an airplane door, the pod needs an 'isle' to walk through. And you need to be able to walk through that isle. So the pod would need to be much larger than Elon's original idea, and that also means the tube will need to be larger diameter. Slip joints for vacuum chambers don't exist yet. You can only have a slip joint when there is no vacuum. So you either have to stop at everyone of the 10 stations (and go through two air locks at each station), which make fast long distance travel impossible, or you need to come up with a different solution for the thermal expansion problem. Let me add that instead of that, you can also invent a perfectly sealing slip joint for vacuum chambers. If you do that, and it is low cost (like a rubber ring) you can put such a slip joint in every (100 meter or so) tube section, and the issue is solved. It is going to be interesting to see how they deal with this thermal expansion problem in the Dubai prototype : They are going to have to deal with about 10 m of thermal expansion. Let me note that thermal expansion and size of the door are just TWO of the many issues with the very concept of Hyperloop design. - How do you 'split' a Hyperloop track, so trains can go to more than one end station ? Not even talking about keeping this system all under near vacuum. Airlocks that can draw a vacuum in minutes. I imagine the station has a short "jet bridge" that connects to the pod after the pod stops. Unlike a jet bridge used in today's airports, it will form a pressure-tight fitting immediately around the door opening, so that virtually none of the vacuum is affected. Once tightly connected, any sort of door (that can be airtight) can open in any sort of way, if space is available. Yet, how do you 'connect' the "jet bridge" to the pod, and how do you disconnect it, while the tube remains under vacuum ?